Al Gore, Rev. Barber tour coal-impacted communities in N.C.
Rev. William Barber II (l) is co-chair of the Poor People’s Campaign; Amy Adams (center) is N.C. Program Manager of Appalachian Voices; former Vice President Al Gore (r). The Poor People’s Campaign held a tour in North Carolina last week that brought together Rev. 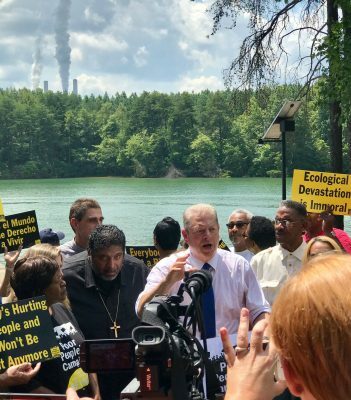 Dr. William Barber II, campaign co-chair, former Vice President Al Gore, his daughter Karenna Gore and residents of coal-impacted communities from across the state. Their purpose of the tour, organized with other national and local groups, was to highlight one of the four pillars of the Poor People’s Campaign (PPC) that contribute to the perpetuation of poverty: ecological devastation. The tour kicked off on August 12 with a Sunday service at Barber’s home church in Goldsboro, organized with help from local people including Bobby Jones, who works with both Appalachian Voices and Down East Coal Ash. The service included local residents Michael Carroway and Mindy Hodgins who spoke on how the coal ash ponds from Duke Energy’s H.F. Lee plant continue to impact the health and livelihood of residents in Goldsboro. Rev. William Barber II (l), and former Vice President Al Gore, August 2018. Photo by Josh Brannon. David Hairston spoke passionately about his role in the Belews Creek community by telling the crowd: “I’m the person that the community calls when they are afraid to bathe their children in contaminated well water. Rev. Dr. Barber spoke to the solutions and the lack of political accountability in North Carolina. Al Gore wrapped up the press conference by speaking to the dangers of harmful energy production and its effect on the climate as well as local communities. Later that evening, the tour concluded at the historic Shiloh Baptist Church in Greensboro. Residents from across the state who face a range of issues — from the threat of proposed fracked-gas pipelines to environmental contamination from coal ash, as well as those fighting for community solar in vulnerable communities — all had a chance to speak from the stage, standing with Gore and Rev. Dr. Barber, to the audience of more than 200. A video that Appalachian Voices put together for Walnut Cove-based Residents for Coal Ash Cleanup, “At What Cost,” was shown. 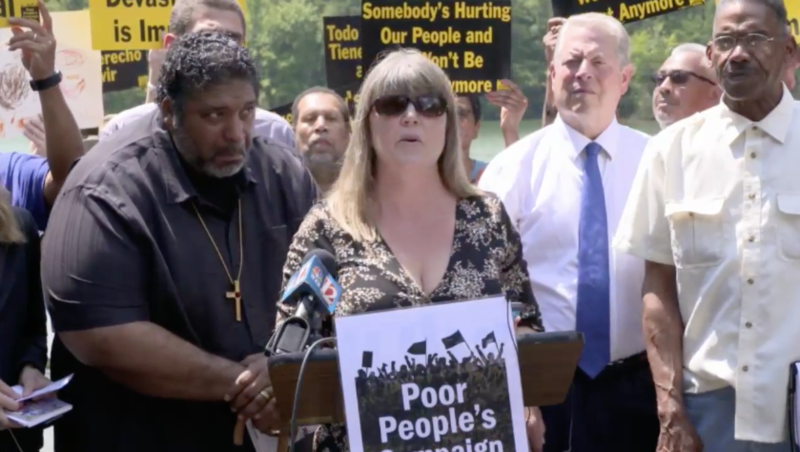 Appalachian Voices is holding a community cookout this weekend with the Poor People’s Campaign and looks forward to working with the organization to promote a greater awareness of environmental and justice issues in North Carolina. Belews Creek Press Conference | NC Ecological Justice Tour: North Carolinians affected by the coal ash pollution of Belews Creek are joined by Rev. Dr. William J. Barber, II, Former Vice President Al Gore, and Karenna Gore as part of the North Carolina Ecological Justice Tour.